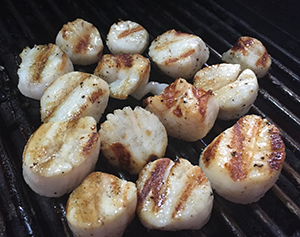 Simple Scallops Grilled to perfection. Clean and remove muscle from scallop (the muscle is the small piece attached to the scallop, this becomes chewy when cooked). Place scallops on large dish. Grind sea salt, black pepper and garlic onto the scallops, to taste. Mix together. Preheat grill to 350-400 degrees. Place scallops directly over the heat. Cook scallops until tender and opaque.